Motherhood.com.my by Nuren Group is a marketplace for women and parents to shop for their essentials covering from maternity, baby, toddler and kids. 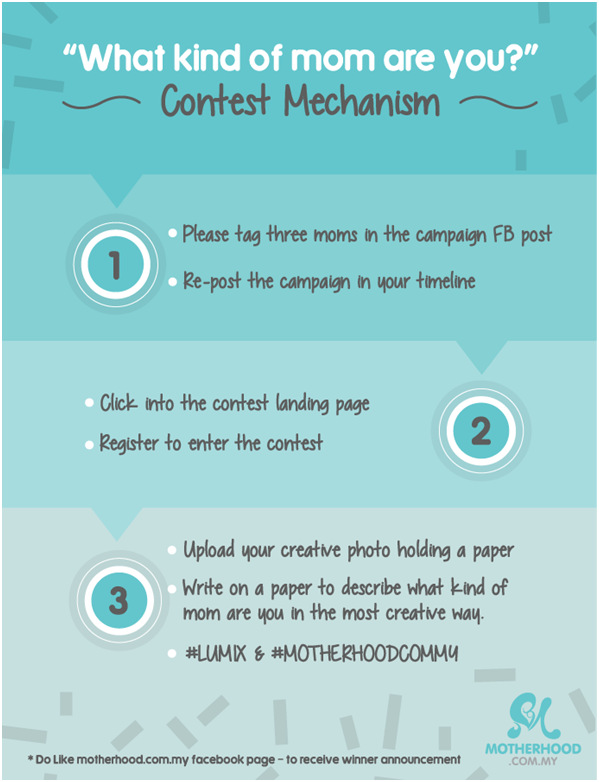 Motherhood.com.my provides useful information regarding parenting, breastfeeding, product reviews, free samples,and testimonials help mothers and couples through their parenting and motherhood journey. 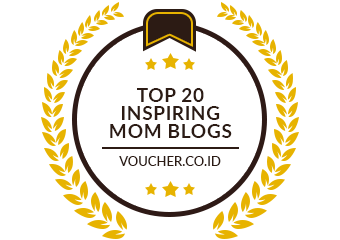 Motherhood.com.my was launched on the 12th of May. 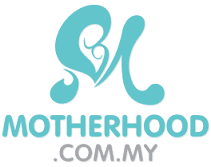 Sign up at http://www.motherhood.com.my/and get RM15 credit now with no minimum purchases. Nuren Group presented a launching party for Motherhood.com.my at the Nuren Group’s office on Saturday the 28th of May 2016. The party was to focus on celebrating the success of launching Motherhood.com.my. Refer friends and earn more credits from Motherhood.com.my. Log on to http://goo.gl/ouWO4t or scan the QR code below for more information. Motherhood.com.my also launched a new campaign, sponsored by Panasonic, to giveaway 5 Lumix GF8 Camera worth over RM10,000. 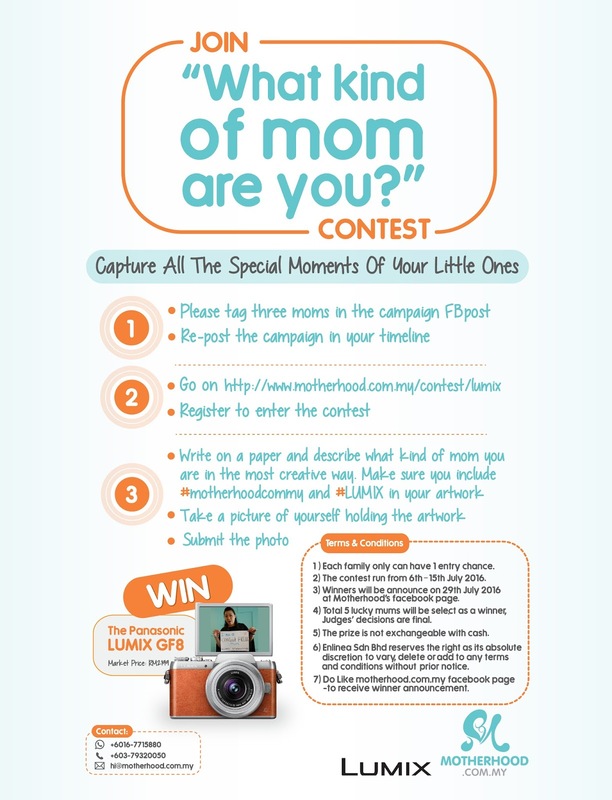 Participants of “What Kind of Mom Are You” contest will stand a chance to win a Panasonic’s new Digital Single Lens Mirrorless (DSLM) Lumix camera. 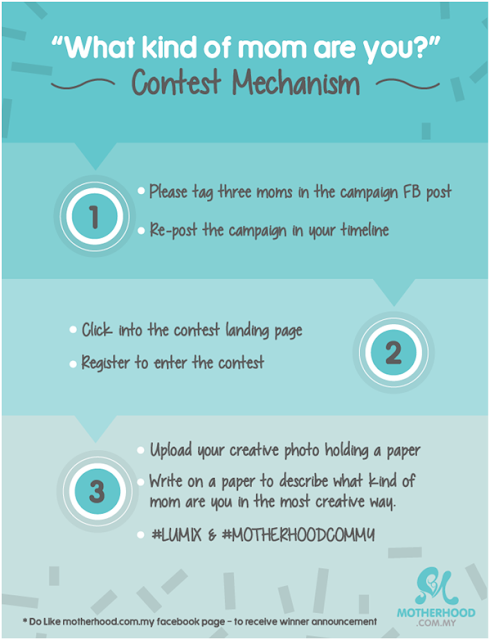 Please see the contest mechanism had attached above, the contest will start from 6th of June and ends on 15th of July. The name of the five winners for the PET PET Pre-Launch Competition was announced followed by the bloggers giveaway appreciation token. Two bloggers received Bayou Lagoon vouchers worth RM590 and five bloggers received NEO STRATA LINE LIFT worth RM398. A lucky draw session was included in the event and two of the lucky winners received Bayou Lagoon Vouchers while 8 of the lucky winners received NEO STRATA LINE LIFT sponsored by Premier Clinic. Coloring session and face painting activities were held during the event for the kids who came to the party. There was also a candy bar, which was everyone’s favorite, especially the chocolate fondue. To wrap up the event, Nuren Group prepared a nice high tea for those who came to the launching party at the Tree in The School at Jaya One. 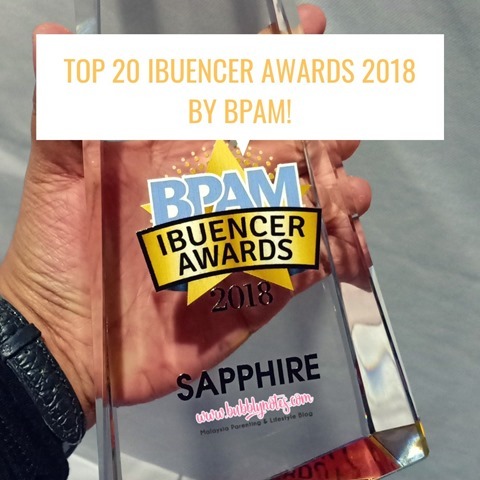 Other sponsors that participated in the event are Green Wellness for Renewallife Korean Healthy Snack and Secret Temptations SdnBhd for Natural Nuts & Dried Fruit Snack.